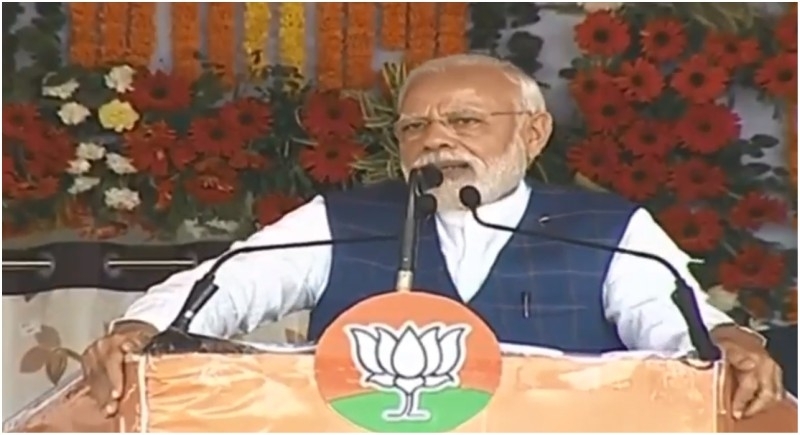 Raipur, February 8: Prime Minister Narendra Modi said that Congress ruined the country in 55 years, while the BJP fulfilled the aspirations of the poor with new resolve. Addressing a public rally at Raigarh in Chhattisgarh, Prime Minister said Congress used the plank of farm loan waivers to benefit middle-men and the corrupt. He said the BJP empowered the poor to fight poverty. He said the Congress’s scheme can’t benefit all the farmers. On the other hand, the BJP government has included a scheme in budget 2019 ‘PM kisan samman nidhi yojna’. This scheme is not a poll plank. BJP’s scheme will benefit the farmers every year. Prime Minister said that after the results of recently held state assembly elections, his government's resolve to work for the marginalised has strengthened. He said that after coming to power, Congress excluded Chhattisgarh from Modi care. Prime minister said that BJP is expanding all over India. He said the Government keeps coming and going, but the resolve to raise the life of normal humans remains unchanged. Union MoS for Steel Vishnudeo Sai and other senior BJP leaders were also present. BJP workers and people from Raigarh and neighbouring district attended the meeting. Earlier today, Prime Minister reached state capital Raipur where he was welcomed by state cabinet minister Dr Shiv Kumar Deharia. Later he flew to Raigarh by a helicopter.